Dr. Ernest L. Isaacson, a board-certified podiatrist discusses foot pain, foot injuries and how that can lead to problems elsewhere in the body. Foot injuries, such as blisters, cuts or a sore can cause ulcers and infections, which in serious cases may even lead to amputation. Dr. Isaacson is a board-certified podiatrist who prides himself on treating the whole person through the lens of their foot health. He graduated from Scholl College of Podiatric Medicine at Rosalind Franklin University of Medicine and Science. He is active in research and publication in basic and clinical science. He is board certified by the American Board of Foot and Ankle Surgery, a fellow of the American College of Foot and Ankle Surgeons and the American Society of Podiatric Surgeons and maintains memberships with the American Podiatric Medical Association, the New York State Podiatric Medical Association, and the American Diabetes Association. Neal Howard: Hello and welcome to the program this morning. I’m your host Neal Howard here on Health Professional Radio, very glad that you could join us. I’m going to be in conversation for a few minutes with Dr. Ernest Isaacson. He’s a board-certified podiatrist based out of New York City and he’s going to talk with us this morning about foot pain and injuries and how those injuries can lead to problems elsewhere in the body. Welcome to the program Dr. Isaacson, thanks for taking the time. Dr. Ernest Isaacson: Thank you very much. Thanks for having me here. Neal: A bit of background about yourself, I did mention that you were a board-certified podiatrist. Where do you practice in the New York City area? Dr. Isaacson: I practice in Manhattan. I’m based in Manhattan and I have another office in the Bronx. Neal: Is podiatry what you always wanted to pursue in medical school or did something happen to steer you toward that particular specialty? Dr. Isaacson: I always wanted to be a doctor. I’m kind of living the dream now but I always wanted to be a doctor, I just wasn’t really sure what I was going to do but I studied Podiatry in college. Neal: Well let’s talk first about a problem with the feet that is very common with people that have diabetes. What is it particularly about the diabetic foot that is so problematic? Dr. Isaacson: Well the issue with diabetes is really there are many complications in the feet that happen from diabetes and the two main areas that we worry about are the circulation and the sensation. So what happens is over time, the artery can become somewhat occluded or clogged from the sugar and that can lead to some devastating complications. So if you lose circulation, you really lose everything but the more common complication that diabetics get is the chemical diabetic neuropathy which is a metabolic breakdown on the nerves that leads to the feet. So it starts a little bit of numbness in the toes, it can really lead to some pretty profound full-on numbness in the feet. When that happens, they’re at high risk for things like open wounds, ulcerous sores and it’s just the beginning of the horror story. This is the reason why 70% of a non traumatic amputations worldwide, they’re done are diabetics unfortunately. So just like anything else, it’s simple prevention and treatment and trying to treat the little problems when they’re little and not letting them become big problems because big problems they’re a lot bigger to treat. Neal: With having no feeling or limited feeling in the foot, you don’t know that you have an open wound or boil or any other problem with the foot until someone tells you or until the problem becomes so bad that you can feel it where the nerves are more alive, is that correct? Dr. Isaacson: Right, exactly and that’s why and I hate say it, it’s the stupid things that’ll get you like anything else in life. And the most common reason for a foot ulcer or for an open wound in the foot is the tight shoe so it’s just something and it just seems like it’s something so silly but somebody who doesn’t have proper sensation in the foot, they can’t really feel anything. They can’t feel it when they step on something when they have a large object in their shoe like a staple or a tack and these are real world stories and so they develop a small open wound, they don’t know it’s there, it festers until it gets all the way down into the bone and sometimes they don’t know until their sugar is out of control or somebody else in the house notices the smell and I hate to be gory about it but these are real stories that happen. And of course then when you get infection into the bone it’s really even in 2018, even with everything that we have, there’s not really a good substitute for removing the infected bone and that’s where the horror story starts. It’s simple prevention, it’s having a minute between months, shaving their calves, checking their nail and just looking at the foot and educating. It’s like anything else in medicine, the simple stuff is so easy to do. Neal: Now when it comes to diabetes, how can you tell that your patient has diabetes? How is it tested and are there different levels of diabetes? Dr. Isaacson: Sure. So not every diabetic will have manifestations in the foot and not every diabetic is going to develop complications. So generally when patients come to me, they’ve already been diagnosed with diabetes. Occasionally some of them will come to me that has real manifestations of the foot that has never just been diagnosed but for some reason they just haven’t been to a doctor and that’s happened. But usually it’s the typical symptom so somebody who is let’s say going to the bathroom a lot, very hungry, very thirsty. If the diabetes is really severe, they can actually, people can pass out from diabetic ketoacidosis versus a real complication of very high sugar. But typically people are getting sent and just to be clear, there are two types of diabetes, type 1 diabetes which is what people think of as more juvenile diabetes where the body stops making insulin and then there’s the type 2 diabetes which is 90% of diabetics in the U.S. which is where the body is not as sensitive to insulin so that’s more of an insidious onset that comes on a little more slowly. There are simple blood tests that will test for high sugar levels and there are other more sophisticated blood tests that will actually measure the amount of elevated blood sugar over a three-month period which is known as the hemoglobin A1C so it’s easily tested in any doctor’s office. Neal: So obviously a person who’s been diagnosed properly with diabetes should pay a lot more attention to their foot as should their healthcare provider, but we all stand on our feet. We all use our feet to do just about everything – athletics, dancing, just walking to the store or walking across a room. What about a person that doesn’t have diabetes but they’re having problems with their feet? What are I guess the main foot problems in a person who’s non-diabetic? Dr. Isaacson: So one of the more common things that I see and imagine many people are standing for a long time so if you haven’t had it, you know somebody who has it. There’s a heel pain condition called plantar fasciitis or heel spurs which is just a strain of the plantar fascia which is a tight band of tissue that originates in the heel typically first thing in the morning and that you have been standing a long time or even not standing a long time and the standing in shoes that may not quite be as supportive as they could be, then it’s very common to develop this type of heel thing. It’s also very treatable and a lot of what I do is just sort of common sense, it’s looking at the problem and figuring out a solution that works for people. So somebody’s not getting the proper support, if you get better support either from a better shoe or something called an orthotic which is a custom-made arch support, then they can go a long way if you’re just creating a better foundation for the foot and going up a chain or the hips, the knees, the back and I don’t treat back pain per se but I have had many patients who come to me with back pain and wants to get a better alignment, better support for their feet then I would probably think to resolve as well. Neal: Now you mentioned poorly fitting shoes being of concern to folks with diabetes. I’m assuming that poorly fitting shoes would be a problem for anybody, especially someone who’s athletic say a runner, someone who’s involved jogging, marathons. There’s a condition known as I guess ‘runner’s foot,’ what exactly is that? Dr. Isaacson: Yeah. 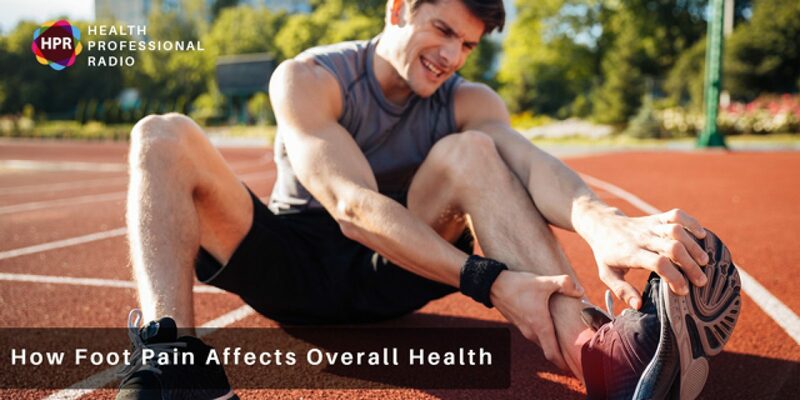 There are a number of lower extremity conditions that can affect the foot, there’s the top five actually of lower extremity running conditions that affect when you go down from the knee. So chondromalacia patella which is also a form of runner’s knee, there’s iliotibial band syndrome, shin splints, Achilles tendonitis and plantar fasciitis so all of those sort of run into the category of runner’s foot. Now I run so one thing that I don’t do generally with my runners to tell them to stop running because I happen to be of the mindset that running is actually good for the feet and good for the knees and everything else but we can talk more about that. I can’t emphasize enough how important it is to get a decent shoe that works for the foot and that has a good wear pattern. The shoes have a life expectancy of about 250 to 500 miles and I’ve had patients come to me who are runners who have foot pain and they say “Maybe it’s time to get new shoes.” And I say “How long have you had those shoes?” They say “Oh about two years now.” That’s a lot of mileage and yeah, new shoes can really make a big difference and a decent shoe, a properly fitting shoe because I’m a podiatrist I’ll say that ideally with an orthotic and I love the idea of a custom-made foot orthotic inside a running shoe. I think is a great combination and it’s what I run in myself and so I hold my patients to that standard as well. Neal: What about kids? They’re developing, they love to run around barefoot indoors and outdoors and they’re changing shoe size frequently until they stop growing, for lack of a better term. What can we as parents do to ensure good foot health not only in the child into their adult years as well? Dr. Isaacson: It’s a good question and as a father of seven, I tend to be a little more relaxed with kids. I also see a lot of children and I have a lot of parents that bring the kids to me, either for what we would call flat foot deformities or like an insole deformity or the concern about the way they’re walking, I tend to be in the mindset of being a little more relaxed because a lot of these foot deformities that you see in kids, even though they may look like they’re horrible and look like something that this kid is just never going to develop out of this, most for these things will resolve and I do believe that kids’ feet need to sort of develop the way that they need to develop. So in other words, I tend to be a little bit more conservative in treating them. I do orthotics for kids, I do a lot of inserts but my feeling is as far as shoes for kids and as far as treating kids’ feet and as far as kids going barefoot, I actually think that a little kids’ feet do better barefoot. Just letting them develop and sort of contact in the ground and developing and over time and things become a little more formed and a little more rigid. For example the arch forms around seven or eight years of age and before that, kids are usually pretty flat-footed. Those kids generally, they have a lot of questioning … they can adapt to the ground really well, I tend to just let them do their thing. Let the foot do its thing in relation to the ground and let them run around a little bit. Those kids for the most part will do okay. Once in a while I see a kid and I see something developing … and I will intervene and maybe get them a little more … and then get them to treatment or therapy or a brace or an orthotic but for the most part kids’ feet need to just develop so my advice to parents is get a shoe that fits the foot well, don’t worry as much about the support and let that foot just do its thing, let it develop a little bit and as long as the kid is old enough to complain, as long as he or she is not complaining then generally it’s okay. Neal: Now I know we’ve only scratched the surface of good foot health, where can we go online and learn some more? I understand you have a web presence. Dr. Isaacson: So I do have a website, thank you for that, it’s www.doctorisaacson.com or nycfoot.com. There are a few national organizations as well, there’s our national body, it’s the American Podiatric Medical Association. They have a lot of good information on their website so it’s a apma.org and there’s also the American College of Foot and Ankle Surgeons. It’s our governing surgical body, they also have a lot of good information out there and to be frank, WebMD is not a bad resource. They are generally pretty vetted and there’s a lot of good stuff out there. Internet information, medical information is always something to be thinking about a little bit of a grain of salt like anything else so you have to take it as sort of a guideline and if you have a good local, friendly local podiatrist that you trust, then you can confirm the information with them. But like any other information, I mean you want to use it as sort of a general guideline and just make sure that you’re getting the information then confirm and verify. Neal: Ernest, I appreciate you coming in and talking with us today and I’m hoping I could talk to you again in the future. Dr. Isaacson: Yes, it’s my pleasure. Thank you so much Neal.